Yesterday was an absolutely gorgeous day in California. Mattie (my Airedale) and I enjoyed fresh air and a long a walk at the local dog park that borders the bay. Mattie loves the little dogs – I think she believes she is a little dog. (LOL) The air was cool but the sun was shining…all in all, it was a wonderful day in the park. At 5:30pm, it was time to do some “market research” (hint, hint ;-)) so I headed to the refrigerator and pulled out a bottle of the Geyser Peak 2012 Pinot Grigio. I was quite shocked to learn the 2012 vintage was already out! The bottle was a clear flint with a screw cap…I am beginning to like screw caps more and more, especially for whites and rosés. The alcohol stated on the bottle was 13% by volume. I picked this bottle up for $12.99 at my local grocery store. In my glass, the wine was a pale straw color. The aroma was very clean and refreshing with a hint of minerality. It had lemon-lime, citrus, peach, and a slight floral note on the nose. There was definitely no hint of oak on this wine. On the palate was a very lively citrus and pear note, followed by peach, and a hint of spice. There was a lingering crisp finish which was quite nice. I would definitely pair this wine with oysters. 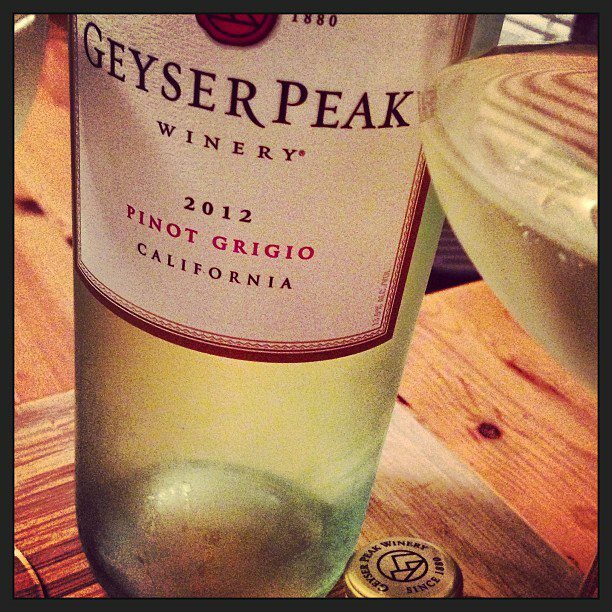 This wine added a nice refreshing finish to my beautiful California day…thank you Geyser Peak!